How spotty are Patience Pig and her piglets?! What a busy maternity ward we have had recently with piglet litters and calves. Robin Cow had a gorgeous heifer calf, now named Blossom. Calves usually take a few days to get used to the world and although they are on their feet very quickly it sometimes takes them a while to get used to all their legs and to the fact that they can go backwards as well as forwards. Blossom was very bouncy once she got the hang of it. Fred Calf, older by one month, got very excited at her arrival and barked like one of those turn-upside-down-and-moo toys. He was desperate to play with her. The cattle have now all been turned out onto spring pasture and there was much jumping and tail-waving and rubbing of heads in the dirt and bellowing for joy. Both Patience and Eleanor Pigs had litters recently. 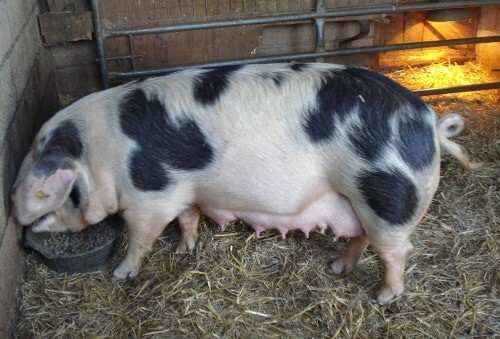 Incredibly spotty litters, even by Gloucester Old Spot standards. So they are all doing well. Both mothers are very tidy pigs, a thing much appreciated by the human who has to muck them out. The hedgerows are glorious at the moment overflowing with frothy cow parsley and over 20 different species of wild flower, that I counted on a short stretch of hedge. When the calves are lying down in the grass they can hardly be seen above the buttercups. The wild life has been really interesting recently too. We've has bull finches eating wild garlic flowers in the orchard and a pheasant and her sweet brood of chicks living in the vegetable garden. The chicks are like little stripy humbugs. Adorable!